The U.S. ambassador to Russia has attacked Moscow’s move toward forcing nine United States government-funded news operations to register as “foreign agents” as “a reach beyond” what the U.S. government did in requiring the Kremlin-funded RT television network to register as such in the United States. 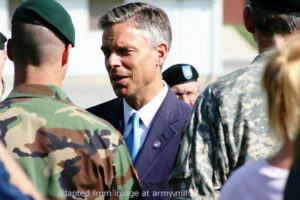 Ambassador Jon Huntsman said during a visit Friday to the Moscow bureau of the Voice of America and Radio Free Europe/Radio Liberty that the Russian reaction is not “reciprocal at all” and Moscow’s move toward regulation of the news agencies, if it is implemented, would make “it virtually impossible for them to operate” in Russia. He said the eight-decade-old Foreign Agent Registration Act (FARA) under which RT has registered as a foreign agent is aimed at promoting transparency, but does not restrict the television network’s operation in the United States. Russia’s lower house of parliament approved amendments Wednesday to expand a 2012 law that targets non-governmental organizations, including foreign media. A declaration as a foreign agent would require foreign media to regularly disclose their objectives, full details of finances, funding sources and staffing. The speaker of Russia’s lower house, the Duma, said last week that foreign-funded media outlets that refused to register as foreign agents under the proposed legislation would be prohibited from operating in the country. However, since the law’s language is so broad, it potentially could be used to target any foreign media group, especially if it is in conflict with the Kremlin. “We are watching carefully… to see whether it is passed and how it is implemented,” said Maria Olson, a spokeswoman at the U.S. embassy in Moscow. The Russian amendments, which Amnesty International said would inflict a “serious blow” to media freedom in Russia if they become law, were approved in response to a U.S. accusation that RT executed a Russian-mandated influence campaign on U.S. citizens during the 2016 presidential election, a charge the media channel denies. RT, which is funded by the Kremlin to provide Russia’s perspective on global issues, confirmed last week it met the U.S. Justice Department’s deadline by registering as a foreign agent in the United States. VOA’s Daniel Schearf contributed to this report.